Less than 5 hours after the bombing yesterday I saw two articles circulating (and several status updates) about pages that were created hours or days before the Boston Marathon bombing ever happened. Q: Is this a conspiracy? A: Things are not always what they seem. I've had it with this stuff. I am a cynical conservative and I don't trust this government one iota, but some things are silly. I believe it is healthy to have an open mind and question things and I never discount a conspiracy. However, I want to teach you today about how these Facebook pages are created well in advance of tragic events like the Boston terrorist bombing or the shooting at Sandy Hook Elementary. I would hope that a lot of people will read this and understand it because we are making ourselves look silly out there. I almost fell for it myself. Let me tell you about Sandy Hook and how I learned what I now know. I was somewhat educated but knowing half of the truth will get you in more trouble sometimes than knowing nothing. Here is the common belief among Facebook folks like myself. You can change the name of a Facebook page that does not have very many members, but you cannot change the URL of the site. This was my belief. I could understand how someone with only 100 likes could rededicate their Facebook page to Victoria Soto, but I firmly believed that the URL (site address) could not be changed. This particular page was one that had "RIP-Victoria-Soto" in the address. This was an obvious conspiracy. Or was it? So I had an 800-1000 word article almost ready to go. I was literally a short proofreading session away from publishing it. Something made me keep looking to verify and I'm glad I did. It would not have been the first time I unknowingly put out false information but at least it did not happen this time. A lot of the arguments that this cannot be done come from people who have changed the name of their page(s) and the address(es) stayed the same. This is a fictitious example but let me explain. Say, for instance, that I have a page called "Dean Garrison is Cool" and I change it to "Dean Garrison is Not Cool." I can simply go in and rename my page and the page may go by the new name but still have the old web address. You can't currently change the name of a Page with 200 or more likes. Changing your Page's name does not affect its username or Page address. Learn more about changing your Page's username. It's a total conspiracy already. This page was created 14 days ago and now suddenly Dean is not cool instead of cool? Oh my gosh the government is behind this. Again, this is not a real page but if you want to make it, it's OK by me. I have a thick skin. I accidentally selected a wrong or misspelled username for my Facebook Page. Can I change it? If the username you want isn't already taken, you may be able to change it. Please note that you can only change your Page's username once. There you have it. The misconception is that a "page name" and a "user name" are the same thing and they are not. The user name is actually part of the URL. If you change it, your site address (URL) will change with it. So what do we make of these stories? First they are circulated by publications and people who do not have any idea what they are talking about. I mean no offense by that because I consider myself somewhat lucky that I was able to figure it out myself. I am not a techie. I would hope that some of them are do-gooders who are just trying to help. They have a page that is not getting much activity and they simply decide to devote it to a new cause that might help raise awareness. The second group is not necessarily as pure of heart. They see an opportunity and try to jump on a hot story. They want a popular page and they will capitalize on a story. However, they may not be trying to add to a conspiracy. The third group is pure evil. These are the people who purposely hold pages with little activity only to jump on situations like Boston or Sandy Hook. Why? Because they want to add to the ideas of conspiracy. I happen to believe that 90% of these page creators fall into group 3 and I hope I am wrong. If you are not trying to add fuel to the conspiracy fire then why would you not start a new page? After all…Facebook pages are free! I try to believe that most people are good but there is definitely an argument there. A lot of the people creating these pages might hold them intentionally to do two things. First they capitalize on the story and secondly they capitalize on the conspiracy. They know full well that some uninformed blogger, like myself, will pick up the story and run with it. 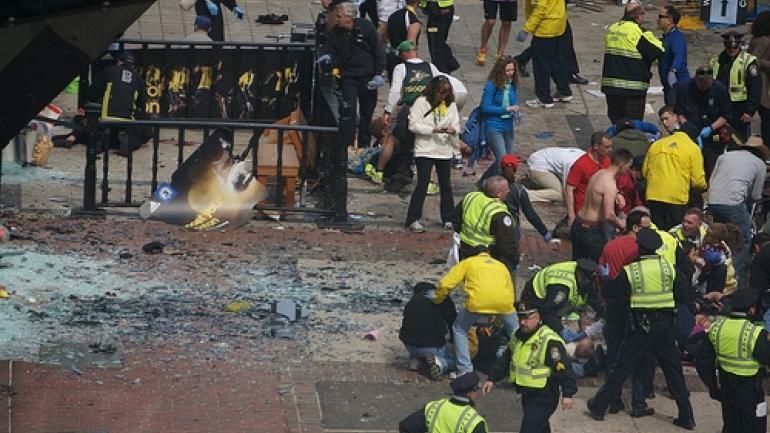 Is there a government conspiracy behind the Boston terrorist attack? I certainly hope not but I will hold my opinion for another day. We barely have any facts yet. I hope I have proven to you that you can't judge any of this stuff by dates that web pages or Facebook pages were created. I can do the same thing on my blog. This article will be published on April 16th, 2013. If World War III starts in a month, all I would have to do is edit this article and the date would remain the same. It would look like I had inside info. I do not and I certainly hope that I was not prophetic in my example. By the way, I am not trying to come down solely on my conservative friends today. Some liberals were out in full force yesterday saying this bombing was likely a plot by "right-wing-extremists." Why do you never hear about terrorist plots from "left-wing-extremists?" Most of the recent mass murderers in this country have been registered democrats. Look it up. It's true. Next Bradlee Dean: What Will Be America’s Fate?